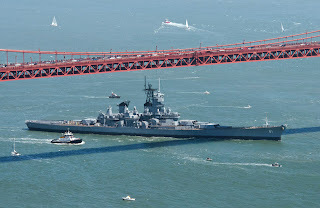 By exquisite coincidence Iowa passed under the Golden Gate Bridge on the day before the bridge's 75th anniversary celibration, and also happened to coincide with the commemoration of Memorial Day, the 'Murrican counterpart to Remembrance Day. It all lends itself to any number of reflections. Swords and plowshares: After a lifetime of honorable service (70 years since launch, less a few months), Iowa is headed for a twilight afterlife as a waterfront exhibit, while the bridge remains a major regional traffic artery. The transience of grandeur: The battleship era still conveys a powerful image, but it was remarkably brief, and Iowa's career belongs almost entirely to its epilogue. None of its class was ever seriously tested as a battleship, i.e. in action against enemy battleships. In World War II the Iowas were used primarily as carrier escorts. During the Cold War era they were periodically recommissioned for offshore fire support. Functionally they were no longer capital ships, though size and impressiveness certainly qualified them for maintaining a presence, one of the most fundamental naval missions. The first battleship is considerably harder to identify. The last generation of sailing 2-deckers and 3-deckers were called 'line of battle ships' in place of the older 'ships of the line.' But this usage disappeared when ironclads came along. The first generation of ironclads had an amazing variety of armament layouts and general configurations. No one knew what the capital ship of the future would be like, which gives the era a wonderfully steampunkish flavor. Russia's Admiral Popov was a radical design even for the era, but shows how unsettled the design possibilities were. By the 1880s the more bizarrely creative designs were set aside. A relatively standard type of capital ship emerged, exemplified by HMS Royal Sovereign, laid down 1889, and the term 'battle ship' came into use to describe them. Today we mainly know them as pre-dreadnoughts. Let us pause to admire the meta-ness of that term. Pre-dreadnoughts ruled the waves for a generation, but for nearly all of that time absolutely no one thought of them as 'pre-dreadnoughts.' Our ideas about these ships are inevitably filtered through their successors, and for half the battleship era retrospective time flows backward. The last engagement between battleships - there were never very many - was Surigao Strait in 1944, so that the battleship era lasted just 55 years. If we take Pearl Harbor as the end of battleship supremacy, 52 years. Thus the battleship epilogue, exemplified by Iowa's career, lasted considerably longer than the battleship era itself did. In fact the battleship era was transitory, not really an 'era' at all. This may be kept in mind when thinking - and most of you are inevitably thinking - of battleships' possible future spacegoing counterparts. Relatively short periods can stand out in our minds and become nearly timeless 'eras,' when in fact they only lasted a few decades. That said, in an an age of post-industrial technological maturity the overall configuration of capital vehicles might be as stable as it was in the age of sail. Capital vehicles - how is that for a colorless expression? 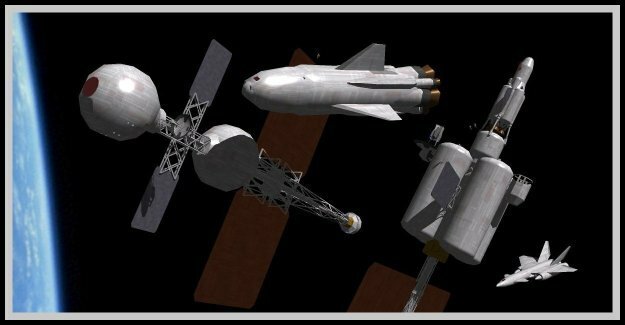 I have argued before in this blog, more than once, that the familiar and time-honored naval analogy may be misleading when it comes to space forces. Laser stars, as I have speculated about them, have only a fairly tenuous similarity to 'battleships.' If kinetics are dominant, the platforms from which they are deployed might be even more remote from the battleship image. On the other hand, the similarities might turn out to be greater, if only because impressive weapon systems have power-political significance that extends well beyond their purely military characteristics. Another Shameless Little Plug: My day gigs include tech blogging for IBM Midsize Insider. No registration hoops or anything like that, and your traffic helps keep this blog online. See my Twitter feed, to the right, for my latest posts there. Feel free to click on them, too! 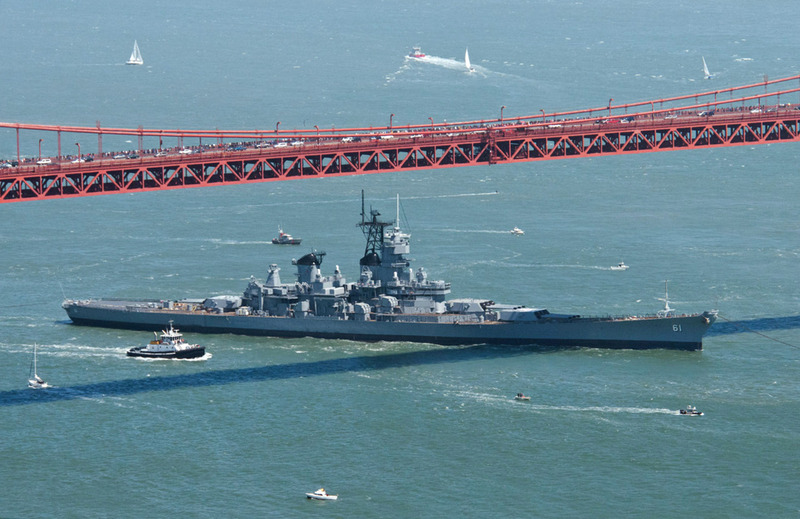 My phone camera image of Iowa passing under the Golden Gate Bridge was too low-res to be worth posting. The Tumblr image above comes from this naval history page.